Penn’s Ryan Betley dives for a loose ball. Tuesday, 6 p.m., at Jadwin Gym, Princeton, N.J. Coaches: Steve Donahue, 3rd season at Penn (39-38); Mitch Henderson, 7th season at Princeton (130-69). 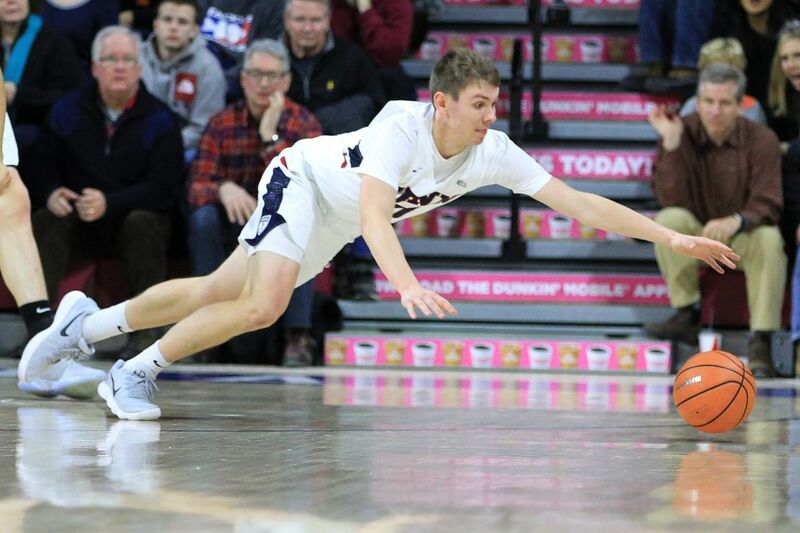 Last meeting: Led by 21 points from Ryan Betley, the Quakers placed all five starters in double figures and defeated Princeton, 76-70, on Jan. 6 at the Palestra. The latest: The Quakers finished up a nine-game stretch at home with a 7-2 record following a sweep of Brown and Yale. … They are playing on the road for the first time since Dec. 9 at Dayton, a span of 59 days. … Betley, who went 3 for 3 against Princeton in the teams' first meeting, is fifth in the Ivy averaging 2.4 three-point baskets per game. … The Tigers split Yale-Brown weekend, losing 102-100 in overtime Saturday night to the Bears. … Devin Cannady, a 6-foot-1 junior guard, is third in the Ivy League in scoring (18.5 points per game) and leads in average three-point goals (3.1) and minutes played (36.0). Tuesday, 7 p.m., at Belk Arena, Davidson, N.C. Coaches: Phil Martelli, 23rd season at St. Joseph's (423-306); Bob McKillop, 29th season at Davidson (545-337). Series: St. Joseph's leads, 8-6. Last meeting: Peyton Aldridge scored 31 points to lead the Wildcats to a 75-60 win over the Hawks at Hagan Arena on Jan. 31, 2017. The latest: The Hawks lost their fourth straight game Saturday, an 81-78 decision at La Salle. Senior Shavar Newkirk finished with 30 points and surpassed 1,000 points for his career, the 55th player in St. Joseph's history to reach that plateau. … Nick Robinson, usually the first guard off the Hawks' bench, is a game-day decision with a thigh contusion. … The teams are the best in the A-10 at taking care of the basketball – St. Joseph's leads with 9.5 turnovers per game, the Wildcats are second at 9.7. … Senior forward Peyton Aldridge of Davidson is third in the league in scoring (19.7 points per game). … The Wildcats lead the conference in made three-pointers (230) and average (11.0 per game).